The Higher Haven takes pride in our connection to the lineages of some of our world’s most formidable spiritual teachers. To understand the essential qualities of the spiritual path, we need a clear sense of direction. We need teachings, techniques and guidance from someone who has traveled the path and therefore can give valid and confident advice about how others could travel this same path. Take part in our one-day workshops or retreats and you’ll experience effective teachings and instruction to help you find a path with heart or advance you on the road that really leads somewhere. Soul Rebel. Wildman. Woodsman. A Natural, Mystic Man. Showman. Shaman. Human. Despite acquiring many of the external trappings our culture offers to bring about a sense of satisfaction and happiness, something was certainly missing from my young life. A decision on the advent of the new millennium led to a cross-country move from the East Coast’s concrete and metal canyons to the hardpan of Arizona’s wild Sonoran Desert, where I found myself seated at a week-long silent meditation retreat. We closed the retreat with a Native American purification Ceremony that markedly altered my nature. In that stillness, I touched a depth of peace beyond anything previously experienced. 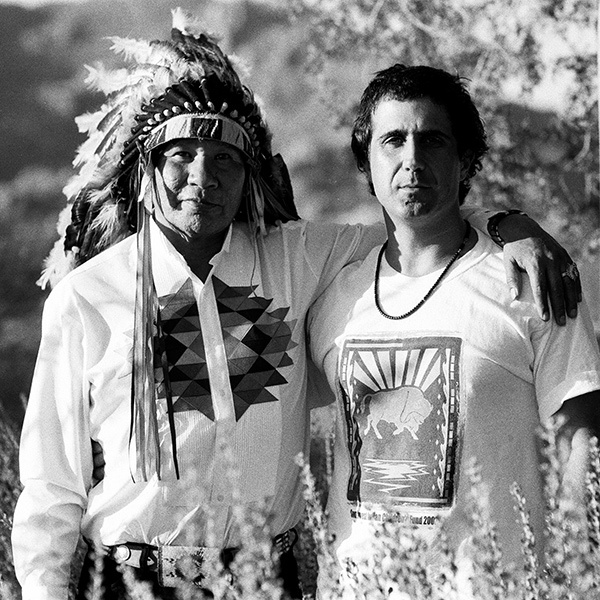 Soon after, I met an authentic Shaman, a Chief and tribal leader who mentored me for several years, teaching me the Ceremonies and mind-training techniques of his ancient culture. Returning ten years later to my Midwest roots, I began sharing my knowledge and experience in 2012. The quick realization came that folks needed more than just methods and direction during an hour-long workshop at a yoga studio. People wanted a Way that would help them rise above life’s mundane frills for a more expansive view, a view that would dissolve their feelings of alienation and penetrate life’s very meaning, not unlike what occurred for me. Most of the psycho-spiritual shifts personally experienced happened over days and weeks on retreat, openings created by extended periods of sitting meditation. Ergo, the need arose for a place of permanent practice, a sanctuary away from the relentless distractions of our modern age. After a diligent search over several years, a stretch of southwest Michigan farmland presented itself in the Fall of 2014, becoming the foundation for The Higher Haven. Shinzen likes to say of himself: “I’m a Jewish-American Buddhist teacher who got turned on to comparative mysticism by an Irish-Catholic priest and who has developed a Burmese-Japanese fusion practice inspired by the spirit of quantified science.” The Higher Haven’s highly effective meditative techniques of Body-Image-Talk and See-Hear-Feel are all drawn from Shinzen’s ample arsenal. A counselor for Native American health services, Phil earned a Masters Degree of Psychology at the University of New Mexico (UNM). Unfortunately effected by some of the health challenges of the Native world, Phil suffered a stroke in the summer of 2005 and soon after took an untimely departure for the World of the Spirit. Happily, the humor and creative spirit of his Heyoka teachings - emanating a power and dignity rarely seen in America today - along with profound Ceremonial healings are preserved at The Higher Haven. John Ashbrook aka The Wizard is a Professional Numerologist, Intuitive Spiritual Adviser, Teacher and Writer. In his almost 30 years of experience, John has written over 200 articles on every aspect of the spiritual life. He is well-known for his loving relationship expertise, career and personal life guidance by a world-wide clientele. John has created and taught an ongoing series of spiritual development classes since 2001. His healing word affirmations have helped countless individuals rid themselves of painful, debilitating health conditions such as tumors, arthritis, migraine headaches, allergies and even asthma. John's individual spiritual development programs are designed to eliminate paralyzing negative emotional attachments that prevent the freedom and joy of total life fulfillment. Spending the day with Paul was nothing short of enlightening. It’s clear that his passion and vision have lead him down a path of divine perception, and though he would never claim to be perfect, his methods are surely ones that will work to bring others that perception as well.